Vegeta developed his arrogant attitude from his place in royalty. Believing only the royal bloodline holds the key to greatest power ( saiyan of legend), Vegeta looked down upon lower class saiyan warriors like Goku. Even the low-class may have great strength potential to become as great or greater than royalty. If the Saiyans weren’t divided into social classes, then maybe that race would still exist…. Some fans believe Vegeta’s true potential was with his mastery of the Oozaru stage. Vegeta grew up believing a saiyan could only become super in the Oozaru stage. If this was so, Vegeta would have reached the level of Super Saiyan long ago, if his tail regenerated from his battle on Earth. Since Vegeta lost his tail, he had to learn how to acquire the super saiyan stage in humanoid form. There were many battles Vegeta could have used his great ape form. 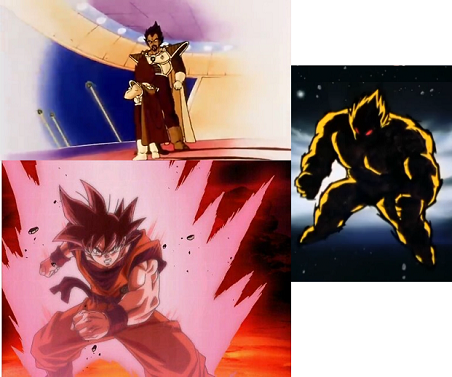 Instead of using the Final Flash on Cell as a desperate need to win, what if Vegeta transforms into a golden great ape?! Vegeta was not featured in Dragonball Evolution, to the relief of many fans. Since Vegeta is a master of the Oozaru form, it only stands to reason that correct visuals would have been needed to capture Vegeta in his transformation stage. Is Dragonball Z too complex to become a movie? Should Dragonball Z become a live action movie or a complete CGI movie like Avatar, Final Fantasy or even Beowulf? Comic Multiverse Fan Favorite artwork of Vegeta goes to the DeviantArt artist Leackim7891. Check out his portfolio!! ‘Dragon Ball Super’ Manga: In ‘DBS’ Chapter 10, Frost Beats Goku, Piccolo Fights Him Next?